In this all new original graphic novel that follows the events of Hellboy: The Island, our demonic hero is caught between the machinations of an Ahab’esque sea captain and a mysterious woman seeking to invoke the ancient world serpent, Heca Emen Raa. Naturally hi-jinks ensue. 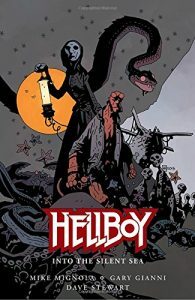 Mike Mignola’s connection to Hellboy is so personal that sometimes it feels like a struggle to accept another artists version of the character. It’s a bit like when your Mam gets a new husband, and even though he’s a decent guy and has a good job and you know your Mam is happy it still feels weird when you catch him putting his hand on her backside. That said, Gary Gianni’s sinister artwork hits just the right sequence of doomed notes and existential dread that I would gladly accept him as my new Dad. Gianni’s sense of scale across the opening pages is breath-taking. The sequence with Hellboy guiding a small vessel across panels of black ocean towards a doomed ship are striking through Dave Stewarts’ clever use of a reduced colour pallet. Hellboys’ stark red form looks uncharacteristically tiny and fragile viewed against against the thirsting enormity of the bruised ocean. These visuals when coupled with an extract from Thomas Haynes Bayley’s poem Oh Pilot Tis A Fearful Night works really well together and succeeds in establishing a foreboding flavour of the troubles headed in HB’s direction. . Into The Silent Sea is full of the good stuff that regular visitors to Mignola’s world have come to expect. The Heliopic Brotherhood Of Ra stirring up ancient evil whilst poking about in lost Hyperborean cities, undead seafarers, vast lurking shadows, plenty of 19th Century mariners superstitions and amphibious hordes dredged up from the stygian depths. It’s like Mignola and Gianni are jamming a medley of Samuel Taylor Coleridge & Herman Melvilles greatest hits at a harbor front dive bar in Innsmouth. There’s something about Hellboy that just seems timeless. It could be due to the simplicity of the character, or the way he views what all that is thrown at him and the situations he stumbles upon and his go with the flow attittude. For a character that has been around for over 25 years, you just don’t get too tired of reading what new adventures are thought up for the demon Anung Un Rama. Taking place right after the events of Hellboy: The Island, our red skinned friendly demon is looking to find a way off of his deserted island and away from graveyard of wrecked ships. Once he does, it is not long before he is captured by a passing ship, the Rebecca, that would be at home in the early 1800’s as well as her crew also. Hellboy is caught up in the turmoil of the shipmates, as some want to sell him to a circus and others would like nothing more than to toss him back into the sea in which he came. Yet the captain of the ship is looking for a creature of legend that has been around since the dawn of time, Heca Emen Raa.